I have been teaching in South Korea for 4 years. I love kids, so it´s great that I´ve been given the opportunity to help them gain more confidence and English-speaking skills. 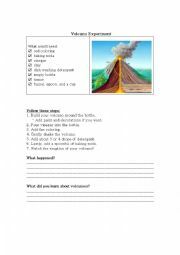 Students read and follow the instructions in pairs or small groups to make a volcano erupt. This is a great introductory reading activity for kids who are new to English. This Powerpoint is also accompanied with a worksheet. It´s a fun board game for students to practice speaking about what´s inside a house. This PPT includes movement to show students how to play step by step as well as a printout of the board game. I laminated them because the students get quite competitive. Enjoy! Since we all love music, this ppt is a great way to have a basic conversation about it. This PPT helps teach vocabulary and dialogue to help students introduce people.